To celebrate the "rebirth" of its cheeseburger mothership, Shake Shack is inviting fans and other hungry people to stop by for all the fried deliciousness and even an exclusive new burger, the ParkBurger, which is topped with applewood smoked bacon and cave-aged raw cow's milk cheese sauce. They'll also be serving up a new unfiltered lager that Brooklyn Brewery has created for the occasion, SHACK PHOENIX. Oh, and the first 100 people in line will get a commemorative model of the restaurant, according to the announcement. And because Madison Square Park is basically synonymous with dog walking, Bocce's Bakery, a longtime Shake Shack partner, will be handing out free ShackBurgerTM dog biscuits from its Biscuit Bike from noon to 2pm. Around the same time, there will be a special performance by Brooklyn United Marching Band. 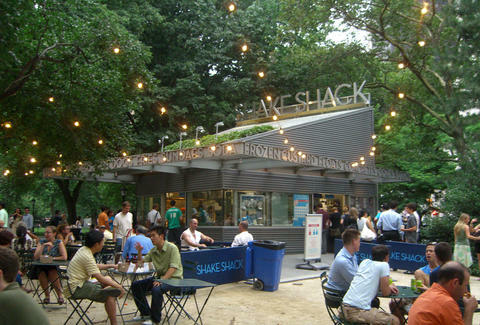 “When Shake Shack renewed our lease with the City of New York, we committed to a complete renovation to restore the original Shack and prepare for the decade to come," Shake Shack CEO, Randy Garutti, said in a statement. New and improved on the inside, the Madison Square Park shack will look about the same on the outside as it has for the last 10 years. No word yet on when the trusty live line camera will return. Tony Merevick is Cities News Editor at Thrillist and can see the long line already. Send news tips to news@thrillist.com and follow him on Twitter @tonymerevick.